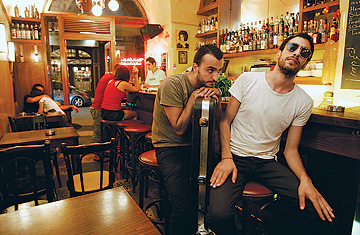 Vocalist Charbel Haber (right) and Tony Elieh bassist from the band Scrambled Eggs. Despite a recent three-month jihadist uprising, a nine-month street campaign by the Iranian opposition to bring down the U.S.-backed government and rumors of war swirling all around, it's business as usual in Beirut's packed nightclubs. The good-looking people in this good-time town have long partied to a sound track of popping champagne corks, clacking high heels and the generic beat of computer-generated dance music--whatever it takes to drown out the beat of Lebanon's continual crises. But for a relatively small number of Beirut hipsters, there's another sound track, one that evokes rather than denies the instability of their lives.